Snack Girl LOVES Indian food and would eat it more except for a few things. Let me list them for you: cream, butter, and oil. Many readers have also requested ideas for low-fat Indian food, so I began looking. I found "The Indian Slow Cooker - 50 Healthy, Easy, Authentic Recipes" by Anupy Singla. This book has changed my life - I am not exaggerating. Do you see that bowl of beans above? I devoured them! Guess how many tablespoons of oil or butter was used in the recipe - ZERO! Yes, you can add some yogurt to these beans, but they don't need any to taste very rich. Anupy has used SPICES, not fat, for flavor and it works. Anupy has included all the Indian restaurant favorites: Paneer, Chicken Tikka Masala, several types of Dal (lentils), and Curried Chickpeas. There are 50 recipes and they cover many of the traditional dishes. My husband has proclaimed that this cook book is his FAVORITE because it combines two things he loves: Indian food and the slow cooker. Now, I am lucky in that I live near a Whole Foods that carries a bunch of different Indian spices. You will have to get some things that you can't find at your local supermarket. Check out I Shop Indian for an exhaustive list of spices with reasonable prices (I am not sure about shipping). For the recipe below, I did not add the chiles or the red chile powder because I thought it would be too spicy for my kids. I did use a tablespoon of paprika to replace the red chile powder and it worked! The other thing is that there are TWO tablespoons of salt here -which makes the beans very tasty - but you should go with less if you are concerned with your sodium intake. My husband heated up the beans on the stove until they were boiling and then added them to the slow cooker. This reduced the cooking time by 5 hours (it took 6 hours to cook instead of 11 hours). These beans pack 24% of your daily value of Iron for just one cup. Isn't that incredible? Reprinted with permission from "The Indian Slow Cooker" by Anupy Singla, Agate Surrey, 2010. 1. Put the kidney beans, onion, tomatoes, ginger, garlic, green chiles, cloves, cinnamon stick, cumin, red chile powder, salt, turmeric, garam masala, and water in a 5 quart slow cooker (large slow cooker). 3. Remove and discard the cloves (if you can find them!) and cinnamon stick. If the beans aren't creamy enough, take an immersion blender and press it two or three times to break up some of the beans. If using a blender, take out about 1 cup and process in the blender, then return it to the slow cooker. Be careful not to process all of the beans; most of them should remain whole. To make this dish in a 3 1/2 quart slow cooker, halve all the ingredients and proceed with the recipe. A half recipe makes 5 cups. @Cheryl - I didn't realize until AFTER I made the recipe what 2 Tablespoons of salt would mean per serving (I do the nutritional analysis after I make the recipe). Yeah, it makes you wonder how much salt is in the restaurant versions. You can definitely go with less and have it work. Always adjust spice to your own taste. How funny that I read this as I am eating my curried lentils (from a package) that is packing a 9 point punch to me without rice mind you! I NEED this cookbook! Thanks so much for sharing! I have been craving Indian food something chronic and we don't have it around here which is sad after living in England where it was everywhere! I have blogged through LOTS of these recipes on my site! This book is a life changer because it requires almost no time, almost no money, and you don't have to use any oil. I will be blogging about more of the recipes too, but have already done at least 15! This book is awesome. If you like Indian food, you absolutely MUST get this book. I do cut the salt in all the recipes because she used a very large salt. When I use plain Sea Salt I only use 1/2 or less than the recipe says. I just listed some of the ones I blogged about on the side of the blog to make it easier to find. Have made many more of them but haven't got them all posted! This book is hands down, the best "cooked" food book I have bought in decades! So easy, it's impossible not to use it. Great for a recession, an illness, or a diet. You can't get fat eating beans!! And Anupy uses all of the foods that Dr. Oz calls "healing" like cayenne, tumeric (good for Alzheimers), Kidney beans (well, all beans!! ), tomatoes & tomato paste, garlic, onion, chilis!! You won't want to go out to eat Indian as much anymore for sure!! It smells like an Indian Grandmother has spent the entire day cooking in the kitchen. Dad's Rajmah is the best, it is an "Indian" type of Chili!! No soaking of beans required!! Ooh I cannot wait! Thanks again! Oh, my stars! This dish sounds fit for a Roman emperor! Dad's Rajmah is awesome too, similar to this, but a little spicer!! We have lived on the stuff for weeks on end! @Vidya. I always used to use a pressure cooker for dals, etc...and love my pressure cooker. However, I accidentally started to use the Slow Cooker when a part broke on my pressure cooker and I needed to order it. I was beyond excited to learn about the Indian Slow Cooker and now I am sold on the Slow Cooker way! 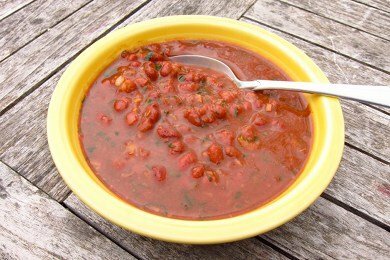 I have noticed that the beans are much more able to be different textures in the slow cooker, and I don't have to worry about them being under or over done. The flavors have such time to meld and I don't have to watch the pot. It is also the best Indian food I have ever made at home. I am not Indian, so if something tastes like I could have gotten it from an Indian restaurant or someone's home, I am ecstatic. I still love the pressure cooker, but I love the way the slow cooker does beans. It doesn't "blow them apart". And the house smells incredible for hours! I love Indian food and south asian dishes. Your picture of the recipe looks delicious. Have you also tried a delicious south asian dish called raita? It is also easy to make and has numerous health benefits. There seems to always be a way to make recipes healthier and still taste good. Thanks for sharing. I like that you talked about how you can't find all the spices you need at a normal store. I have been wanting to eat healthier, but I wasn't sure what to try. I'll have to try an Indian restaurant first to see if it is something I like.